If you're trying to get started in the music business, it can sound like everyone is speaking a different language, with buzz terms and music-specific lingo. This guide can help you understand the industry. 360 deals: An increasingly common major label deal structure in which the label not only earns income from the sale of recorded music of their artists but also gets a cut of other artist income, including money generated by touring and merchandise sales. Agent: Someone who liaises with promoters and venues to book gigs for bands. "Big Three" record labels: Major record labels. Demo: A sample recording of a band's music. 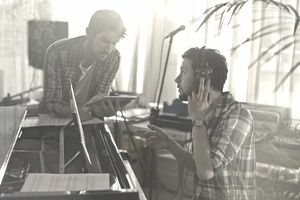 Often rough recordings or early versions of "songs in progress." Digital distribution: Distribution of music online, i.e., downloads. Digipack: A type of CD case that looks like a book instead of a plastic case. The outside is made of paper and the CD sits in a tray inside that is attached to the paper. Door split: A type of payment deal for a live performance, in which the band and promoter agree to split the proceeds of the show after the promoter has recouped their costs. Gatefold sleeve: Vinyl album sleeve that folds out either opens like a book or fold out in three sections. Usually used for double LPs or special artwork. Sometimes the gatefold format is used in a smaller format for digipack CD cases. Indie labels: Self-funded labels not tied to any major label/Big Four label. Jewel case: Traditional plastic CD case, also sometimes called a jewel box. Longbox: The cardboard boxes that manufacturers and distributors use to send out CDs; there are 25 in each longbox. Manager: Essentially the business manager of a band. Duties vary wildly depending on the level of the band, but generally, managers try to seek out new opportunities for the band while being the contact person for all other people dealing with the band. Mechanical royalties: Royalties paid to the songwriter per album pressed. Also sometimes called "mechanicals." One sheet: The info sheet for a release; this can contain info about the band, the recording or anything else significant about the release. One sheets are used by labels and distributors to sell a new release. They get their name from the fact that they are (or at least they should be) one page long. P.D.s: Also PDs. Short for "per diems," which means "per days." It refers to the stipend paid daily to band members and crew on a tour for their personal expenses, such as food and drinks. PR: Technically means "press relations" but is also used in a slang way to refer to a person who works in press relations. PR is also known as "publicity." PR companies/PR people are usually hired to work on a campaign basis to promote a new album, single or tour. Some PR people only promote to print media, some only to websites, some only to TV and some to a combination of mediums. Some PR people also work in radio plugging, but often radio is treated as a separate entity. Performing rights royalties: Royalties paid to a songwriter when a song they have written is performed. Playlist: The list of songs played by a radio station. For some radio stations, the playlist is up to the DJ. Other radio stations have set playlists of songs that have to be played. Often these radio stations have tiered playlists, such as A list, B list and so on, that dictate how many times a day a song has to be played. Promo: A promotional copy of a recording, different from a demo in that it is usually a finished version of the recording. Promos can be complete copies of an album complete with artwork, or they can be CDs in cardboard or plastic sleeves. Promo package: A package used to promote music, including a promo CD and any appropriate press releases, one-sheets, photos, and other information. Also known as a press kit or press pack. Promoter: Someone who promotes live performances for bands. Publishing: Essentially another level of copyright control for songs, publishing deals simply put a person in charge of making sure the appropriate amount of royalties are collected for a song, in exchange for a portion of those royalties and some rights to the song. Most publishers go further than that and actively try to place songs in revenue-generating positions, like advertisements or with other artists for a cover version, etc. Radio plugger: Also sometimes simply known as a plugger, radio pluggers promote releases to radio. Pluggers usually work with specific singles and go around to radio station playlist meetings, playing the singles they are representing and trying to get them placed on a playlist. In some cases, pluggers may work with full albums, letting the stations themselves decide what the single is. Session musician: A musician who contributes to a recording or a live performance but is not actually a full-time member of the band. Sound engineer: Generally, the person in charge of making the sound for a show work. There can be many different specific roles for a sound engineer. Tech spec: Short for "technical specifications." A venue or promoter usually asks for a tech spec so they can set up the stage properly for a band and ensure all of the band's technical needs can be met. Tour manager: Tour managers take charge of the details of a tour. They travel with the band and do all of the jobs like checking into hotels, liaising with promoters and generally trying to make things go as smoothly as possible. Also sometimes called a road manager. Tour support: Money paid out to cover the costs of a tour, usually by a record label. Tray: The plastic part of a jewel case or digipack that the CD sits in - the part with the teeth. Tray card: The part of the album artwork that sits behind the tray and is seen when you look at the back of the CD case.